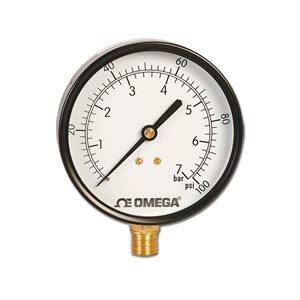 OMEGA’s PGU series utility gauges provide economical, reliable service in a wide range of applications including pumps, compressors, and other equipment. Series PGU utility gauges come in ranges of (psi/Bar) 0-30/2, 60/4, 100/7, 160/11, 200/14, and 300/21 psi with an accuracy of ± 3-2-3% of span. Gauges are available in 38 mm (1½"), 50 mm (2"), 63 mm (2½"), or 89 mm (3½") steel cases with center back or lower mount NPT connections. Nota: 3 1/2 inch gauges are available with lower mount fittings only.